He was mildly interested in me, but far more interested in falling asleep, which he did about one second after this picture was taken. I met Diane six years ago. I was looking for a B+B in Massachusetts that would allow me to bring Wilson. It was kind of random but I picked her place, The House in Pumpkin Hollow, in Conway, Mass. I was pleased to find a relaxed welcome in an old time country Victorian with the most interesting prints and books everywhere and beautiful large windows and jewel colored walls. I also found a congenial golden retriever friend for Wilson, and a wonderful friend for me. Diane has a PhD in Sociology from the New School in New York City and was an operations expert for the Mayor’s office for City of New York and the Director of Litigation Support for the NY DOT (That's about traffic tickets!) for ten years. It’s a pleasure to watch her intelligence and operational, organizational skills applied to making my breakfast. She does make the best biscuits on the planet, but of all her surpassing skills, the most surpassing of all is her ability to grow golden retrievers. This puppy is blurry because she is still in the process of tumbling off of her mother's back. Every so often you find a person who is built to do exactly what she is doing and this is true for Diane with her puppies. She’s got it down to a science, but the best thing is how she loves them. She’s just so happy to sit with each puppy and with all of them together. She does it by the hour. As a result, these are the roundest, calmest, most well-socialized puppies I’ve ever seen. Brother Nick and I went up to visit her last week because I had to see her litter. 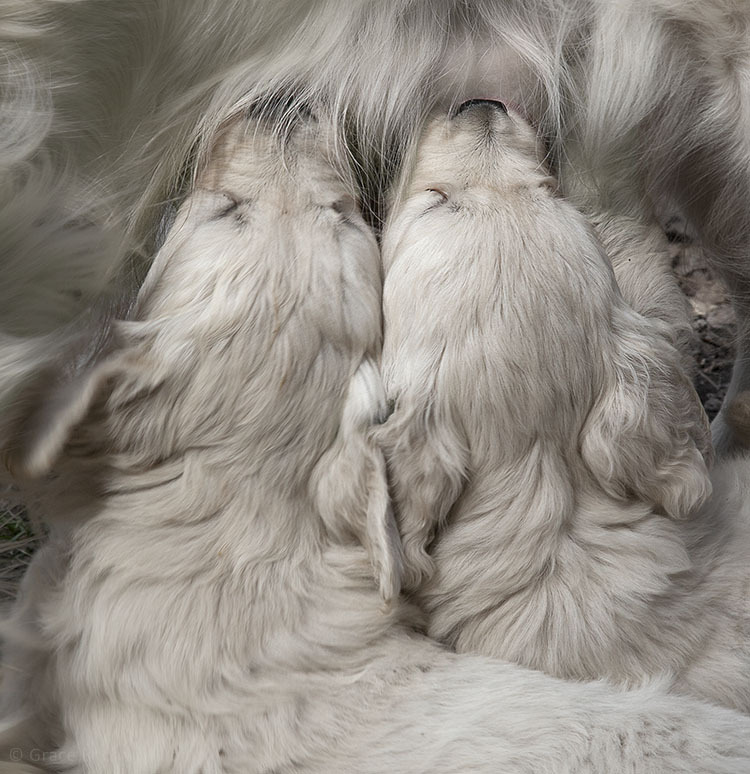 There were only three puppies – an unusually small litter for goldens. They are five weeks old. They’ve all been sold and will be leaving in a few weeks. I have no doubt that by then they’ll be speaking English and possibly a second language. In any case, it was impossible for me to be unhappy while I watched them tumble around. I am quite pleased to show you her puppies. A prior litter and a little snooze. PS. Diane will be raising another litter, probably, next spring. PPS. Diane is an excellent writer and would welcome guests to sit by her fire and write. Diane is irreverent and warm and liberal and wise and articulate. She can be reached at: http://www.pumpkinhollowhouse.com/. PPPS. My entire family prophesied that I would come back with one or two puppies. I did not come home with puppies. This is one of the new puppies with River, his (or her?) half brother. Working hard to get up to mom. Because there are so few puppies, Jonesy often nurses standing up. So we are able to see how happy they are about it. Here is Jonesy with one of the new puppies. This is just to prove I haven't gone completely Hallmark. This is a little cheesecake shot of Jonesy when she came to visit Block Island as a puppy. Jonesy said it was alright to go with this picture... it is integral to the story after all. The dog on the right is Molly at about one year old. Another picture from the same litter. 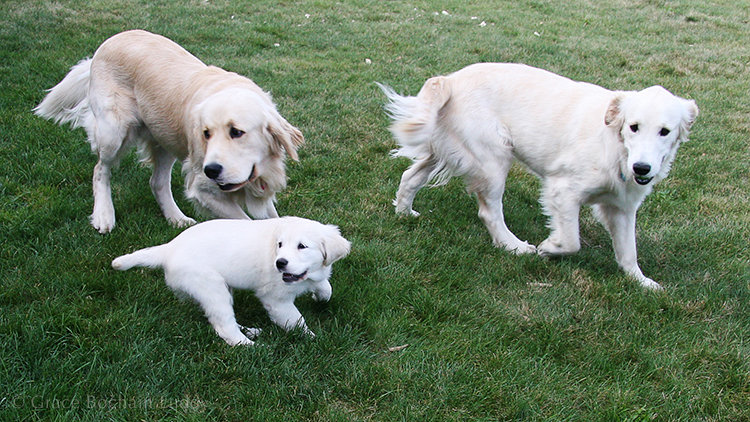 This is Jonesy as a puppy, Molly at one year old, and Molly's brother Barkley. All at our house on Block Island.